Pancakes can be kind of tricky at home. 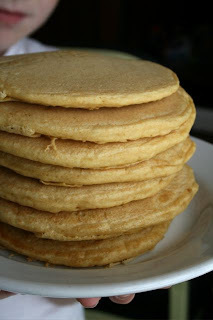 Getting the just right fluffiness that you get from your favorite breakfast place is not that easy, but these came out so light and fluffy...you can have your favorites without the stomach ache now! My littlest one, Max, had a breakfast request not too long ago and I was happy to jump in the kitchen for this one! These came together in no time and we were very happy after this meal! Lightly spoon both flours into measuring cup and level. Combine all of the dry ingredients in a bowl. In a separate bowl, combine the rest of the ingredients. Pour wet mixture with the dry mixture. Stir until combined. Poor batter onto a hot nonstick griddle or skillet that has been coated with cooking spray. Flip pancakes when little bubbles star to form on top and the edges look cooked. And enjoy! This made 9 pancakes for me (I used 1/4 scoop). I will definitely be trying these, I love that you didn't add a bunch of sugar! nice work. i love that you stacked them!